My husband Marcelo has always been fanatic about horses. 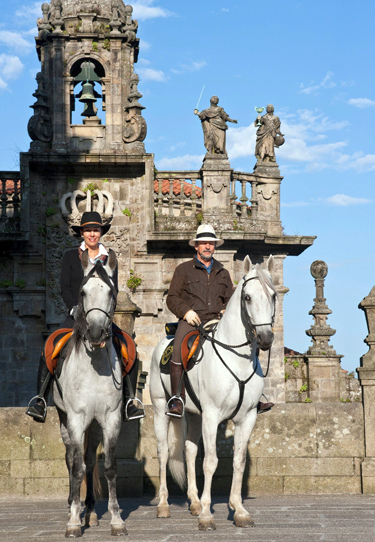 He has raised Mangalarga Marchadors for thirty-one years now and as a great enthusiast and developer of the breed has cherished the dream of riding the Saint James' Way in Spain, otherwise known as El Camino de Santiago, on his own very own horses. The Way of St. James was one of the most important Christian pilgrimages during medieval times. 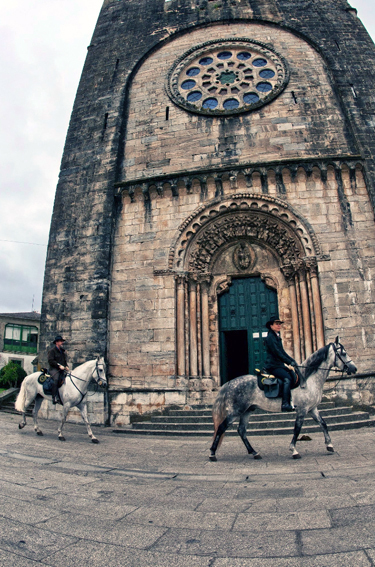 Today, many people hike, bike or horse ride along this spiritual route to to the Cathedral of Santiago de Compostela in Galicia in northwestern Spain. In 2010, when he accepted the invitation from ABCCMM to join the "Projeto Vitrine do Marchador" in Europe, he promptly realized that the time had come. He would finally have the opportunity of making his old dream come true. At the time, Marcelo had just turned sixty and Haras Maripá had "turned" thirty-years-old marking two good reasons to celebrate "comme il faut", meaning in this instance: in the saddle! Two stallions, Patek and Urano de Maripa arrived in Germany in November 2010. Despite the cold setting in across Europe, they easily adapted, thanks to Astrid, Dieter and their team, all wonderful people to whom they were entrusted. We visited them during the Equitana horse exhibition, last March, and were very happy to see how well and healthy they were. After that we returned to Brazil, certain that our adventure would have a great chance of success. Haras Maripá has been developing its own bloodline by breeding horses themselves. Our stallions are the sons of Oma de Maripá (Laio de Maripá x Martinica HO, both in Brazil’s ELITE book). Patek is the result of extraordinary genetics that come from Laio and Moderna de Maripá. Laio has been a national champion and his mother, Festa AJ, an unforgettable breeding mare, was also a national and gait champion known for her beautiful chestnut coloring. Moderna de Maripá comes from Laio and Emoção de Maripá. The formerly mentioned, represented by Herdade Jupiá, was a 4-time national champion. The latter is a daughter of Furacão Bela Cruz and Cafundó 3 Pontas, descending from two of the most ancient and traditional Mangalarga Marchador's farms: Abaíba and Herdade. Cafundó 3 Pontas was one of the most important of Cafundo's mares, an animal known for its comfortable, laid-back temperment. The second of our stallions, Urano, is the offspring of a crossing of our genetics with the lineage 53. His mother, Bejota de Maripá, is a daughter of Major Pitanga's, one of the best horses Marcelo has ever ridden in terms of comfort. Urano is a grandson of Bagdá de Maripá's, full sister of Laio's, and great-grandson of Festa AJ's. Initially when we spoke about this project people were skeptical about whether two four-year old stallions of pure bloodline could successfully complete such a ride. People doubted the viability of the whole project, some refusing to help or participate. Marcelo, however, an expert with his horses, was always certain of their resilience and docility. He knew they loved marching (demonstrated in the beautiful photos taken by Paula da Silva, who joined us during the last days of our trip to record our adventure) and could complete the trek. 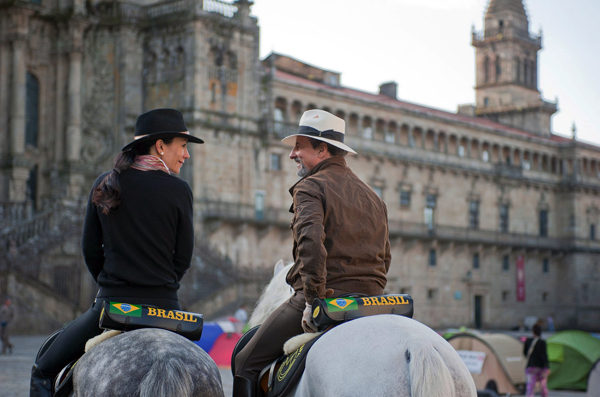 Paulo Junqueira and Aurelio Tagua del Pozo also trusted our horses and took on the responsibility of organizing the logistics of our trip. Sergio Beck believed in the project from the beginning and supported us the entire time, even riding with Marcelo during the first days before I arrived to ride the Galician part of the "Camino". We also had the company of Juan Bajo de Isasi, our guide, and his mount Miguelito, a chestnut vaulting horse very adapted to the "Camino". All of these friends proved totally indispensable! During the trek we rode about 19 miles (30 km) per day, at an average speed of 5.5 miles (9 km) per hour, depending on the ground. At times the terrain was quite difficult, marked by stones, gravel and some parts with very old, rocky paving. 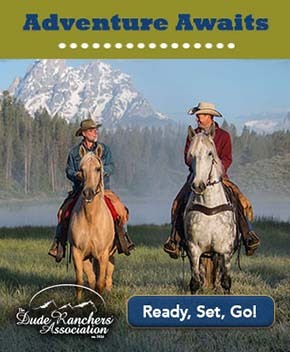 We used special equipment on our horseshoes to have more adherence, and our brave horses stood strong! All they wanted was to ride, to get back to the road! Each day we got in the saddle at about 10 in the morning. We always stopped for lunch at amazing places previously chosen by Paulo and Aurelio. While we had lunch, the horses were fed and groomed. 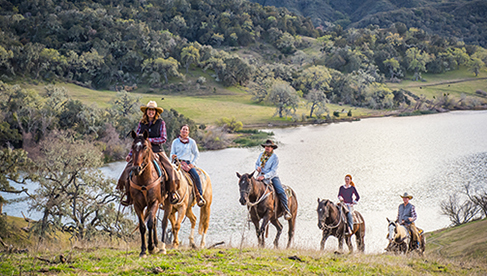 When back in our saddles, our horses were ready and eager to go back to the trail. We usually arrived at our destination around 5 in the afternoon at which time the horses would go to their stables, and we to our hotels to get ready for dinner. On a trip like this, you end up spending a lot of time with your thoughts. Marcelo used to say that what he had in mind when we'd stop by the churches along the "Camino" for our prayers, was a wish that people would treat animals more humanely, that their behavior be more focused in love and less in violence. Our experience on the "Camino" was transformative. It is really a very ancient trail, Celtic and mystical. 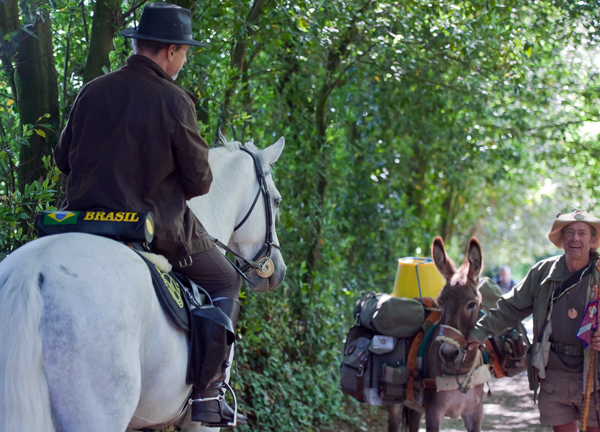 The pilgrims we passed along the way would always regard us with curiosity at first and then astonishment when learning that our horses had come all the way from Brazil. 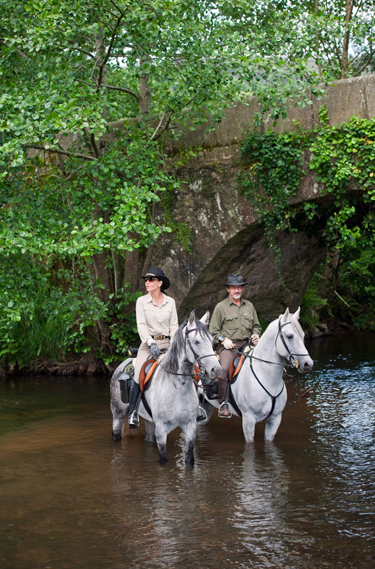 For the first time, Brazilian horses were trekking across this sacred trail!